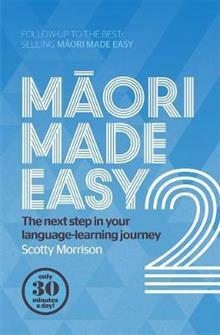 The bestselling Maori Made Easy gave learners an accessible and achievable entry into te reo Maori. It quickly cemented itself as the guide to those new to the language. Scotty Morrison now offers a second instalment to help readers continue their learning journey, picking up whe... read full description below. The bestselling Maori Made Easy gave learners an accessible and achievable entry into te reo Maori. It quickly cemented itself as the guide to those new to the language. Scotty Morrison now offers a second instalment to help readers continue their learning journey, picking up where the first volume left off. Maori Made Easy 2 unpacks more of the specifics of the language while still offering an easy, assured approach. By committing 30 minutes a day for 30 weeks, learners can build their knowledge in a practical, meaningful and fun way. Enhance your reo Maori learning with the most reliable - and easiest! - resource available.